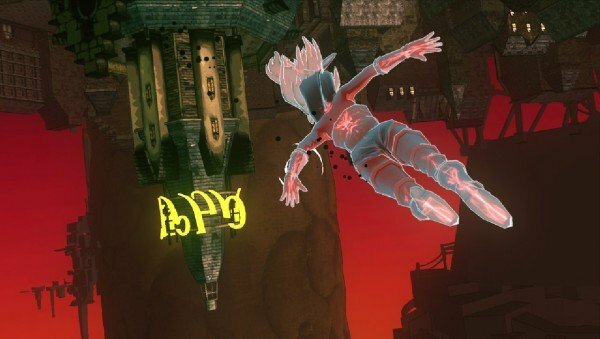 Gravity Rush is a unique experience that offers PS Vita owners something different, but its focus on frustrating combat holds it back. Developing a brand new intellectual property in the video game industry is risky business. Having nothing to draw from means that their costs are almost always higher than that of sequels, and there’s never a guarantee that those funds will be recovered through sales. With that receptive uncertainty taken into account, it’s understandable that a lot of companies have seemed to shy away from delivering new experiences in favour of projects that they know will make money. Though, while some applaud that mentality and look forward to lining up for a popular shooter’s fifth sequel, there are many others who dream of an industry that was more open to experimentation. Thankfully for those folks, and those of us who like a mix of everything, there’s still a decent amount of development teams out there who are vying to create the next big, but unique, thing. Applauded for its creativity and talent, Sony‘s Japan Studio has brought us incredible experiences like ICO & Shadow of the Colossus. 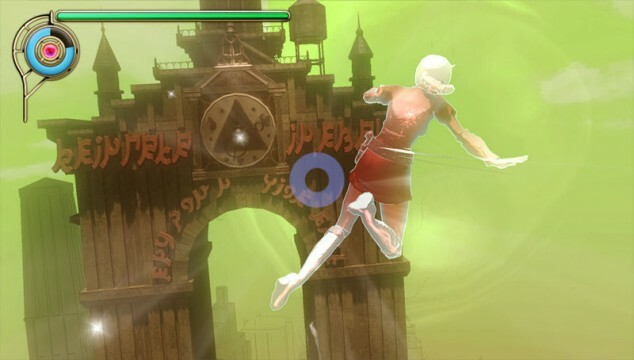 Now, the deservedly popular development arm has released Gravity Rush for the fledgling PS Vita. Having become one of the portable’s most talked-about projects since it was unveiled, the game recently debuted to lofty expectations in North America. As a new intellectual property, Sony‘s need for its latest first-party release to become a flagship system seller is evident. But, in the end, the game isn’t as masterful as everyone hoped, though it still delivers a well above average interactive experience. Known as Gravity Daze in Japan, this portable exclusive centres upon a young amnesiac and her magical cat, both of whom abruptly appear in the floating city of Hekseville. With no recollection of who she is or how she ended up in such a foreign land, our assumed heroine, Kat, quickly learns that she’s much more than a regular girl. This occurs early on when a gravity storm erupts, threatening to absorb a small boy. His father’s frantic pleas lead players to learn of Kat’s incredible powers, which are attributed to her status as a gravity shifter. Instead of having to rely on the laws that ground us humans, as well as our digitally crafted representations in this game, Kat can use the pull to float, fly and fight through the air. 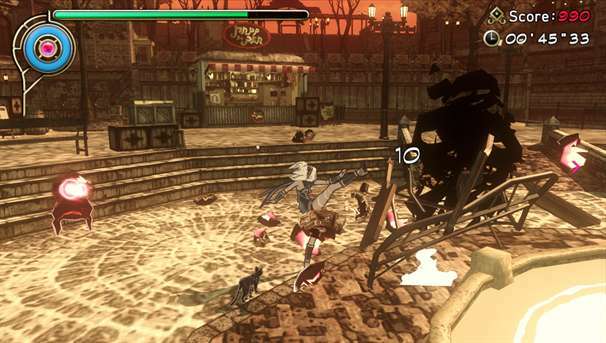 Those abilities end up forming the basis of Gravity Rush, delivering unique mechanics that make the game memorable. Relying on a slowly depleting meter as sustenance, players must use the Vita’s shoulder buttons to move throughout the city, with the option to land on pretty much anything. It’s a really neat idea, which has been realized quite well, although it’s not surprising that such a new premise would come with drawbacks. Flying to spots above or below targeted areas is a frustration one must endure, as are the environmental objects that occasionally get in the way. Camera issues also factor in whenever the avatar lands on an eave or somewhere she’s technically not supposed to. Though, most players will get used to those problems, learning ways of how to avoid them as they adjust to the game’s slight learning curve. After learning how to use her powers by becoming a good samaritan, our scantily-clad friend discovers that her new home isn’t the paradise it once was. Created as four different but connected regions, Hekseville has seen better days. Recent storms have ripped the regions apart, creating barriers that block access by train or air ship. That’s not the worst of it, however, as families and friends have been ripped apart from each other, with each side fearing for the other’s safety. We’re caught in the middle of all of this, constantly learning about the world and its issues, while attempting to help by gathering crystals to fuel necessary contraptions like bridges and refineries. The Catch-22 is that those same crystals act as upgrades for Kat’s health, powers and physical prowess. What sets us on our way is hope. The non-playable characters whose rumours help to add sustenance to what ends up being a convoluted yet somewhat interesting storyline, are full of hope that their world can be restored to its former glory. They do their best to help teach Kat the way of the land, giving her insight on how to bring each region back from the depths of doom. Thus creates a ten hour-long campaign where players must harness the power of gravity shifting to outmaneuver storms, battle corrupt evildoers and save a land in peril. Of course, alien beasts known as Nevi had to be added in order to provide extra challenge. It’s their black goo designs, with red life crystal targets, which will act as the main bad guys in Gravity Rush. Though, while they’re neat-looking, the ugly beasts lack creativity, and end up providing extremely repetitive battle scenarios. Where Gravity Rush excels is in its creation of a beautiful world that really feels alive. Hekseville is gorgeous with its four individual regions reflecting its different needs. There’s the industrial region where the city’s inhabitants work, the more relaxed area where they reside, and a required red light entertainment district. On top of that, a gigantic school campus sets the stage for one of the game’s more memorable boss fights, though most of those are too basic to be fun. That’s because they all boil down to the same thing, much like their more basic peers. You fly through the air, then zoom down towards a red weak spot. Rinse, then repeat. If you’re noticing a trend here, that’s the hope. No gamer should purchase this title with the expectation that it will deliver great combat and exhilarating air battles. Unfortunately, that truly isn’t the case, as Gravity Rush employs a basic combat system that lacks a helpful targeting system and mainly focuses on kick attacks. There’s little fluidity to be found, and it’s easier to miss opponents’ weak spots than it is to hit them, meaning that a large amount of each user’s time spent in combat will boil down to frustrating moments where Kat fails to land gravity kicks. When it connects, the attack is neat to watch, but the development team dropped the ball when it came to figuring out how to let us hit an enemy that is moving and wriggling throughout the air. 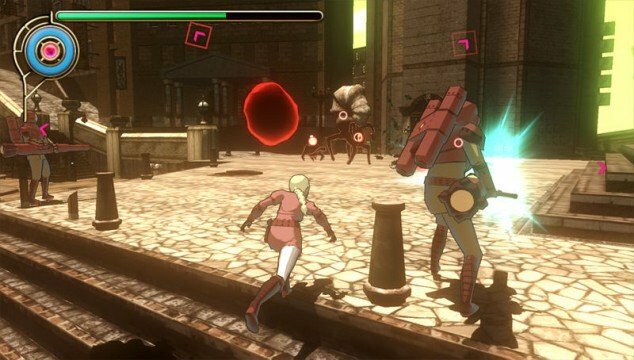 Despite its inclusion of a ho-hum combat system, which it relies on far too often, Gravity Rush will still immerse those who give it a chance. Zooming through its created city while looking for people to talk to, machines to restore and/or gems to find, is an enjoyable experience in its own right. Helping regions unlocks challenge missions, which cull their designs from traditional races and timed combat scenarios, throwing in unique twists like the option to fly from one checkpoint to another or the ability to pick up and throw items using gravity. They add extra replay value, along with the thousands of hidden gems that dot each region, but some are more frustrating than fun. The most egregious type happens to be a timed race design that forces you to slide by putting your thumbs on the touch screen’s bottom corners. Movement is controlled through tilting the Vita, but it doesn’t work very well. Outside of the aforementioned gravity slide and its annoying controls, Gravity Rush makes good use of Sony‘s handheld and its interesting capabilities. While it doesn’t use the rear touch pad at all, it does use the OLED screen’s touch recognition in ways that end up improving the experience. Cycling through menus, upgrade lists and the world map with the use of one to two fingers is an appreciable option that adds accessibility. As does the need to press within a blue circle to finish off a super foe. Though, where the touch controls are at their best is during story segments, as many of those are told using beautiful motion comic frames. Players can swipe through them or tilt the device for a new viewpoint on the hand-drawn action, which creates a wow factor thanks to stylish design elements. While the comic book panel storytelling is done with flourish, its panels aren’t as impressive looking as the full game. Combining anime style drawings with cel-shading, Gravity Rush has a look that will blow away any person who gives it the time of day. It’s absolutely stunning, and looks great in action, especially when you pay close attention to how each region’s details filter in as Kat flies towards them. There aren’t many downsides to be found in this visual presentation or its audible complementations, which mix high-quality orchestral music with strange languages and surreal sounds. However, the game is not a stranger to frame rate issues, though they aren’t common place. Now that it’s available and some of us have had a chance to give it a whirl, questions regarding whether Gravity Rush is a worthwhile investment have become a dime a dozen. If you’re looking for something unique and creative, and happen to be willing to overlook certain deficiencies, then it’s definitely something you should look into. At its core, there’s an above average game here that everyone should try at least once. Though, it’s hard not to think that more time in the proverbial shop could have helped make it a more entertaining combatant. Then again, combat isn’t its only draw, meaning that those who love exploring visceral worlds will want to jump in for the adventure.